Classic apple pie flavors baked in unique Apple Pie Puff Pastry Rolls. Easy apple pie and cranberry filling inside flaky puff pastry layers, baked as a pull-apart casserole for a unique fall and Thanksgiving dessert recipe. It’s officially fall season, especially now that I’m making apple pie recipes. I find myself enjoying baking more in the colder months, and can’t think of anything better than apple pie. Granted apples are available year round, but seem so much better this time of year. 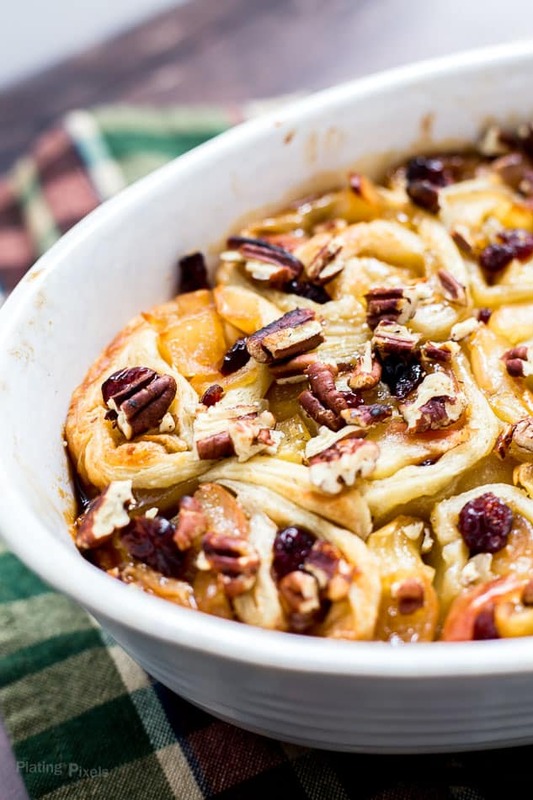 This isn’t your standard apple pie in a round crust though, we’re talking Apple Pie Puff Pastry Rolls baked into a casserole dish. Yes this just happened. The center is essentially an apple pie filling. Fresh, sweet apple slices cooked down in butter and sugar. Mix with brown sugar and cinnamon (of course) and you have a quick and simple apple pie filling. The true star of this recipe is puff pastry. 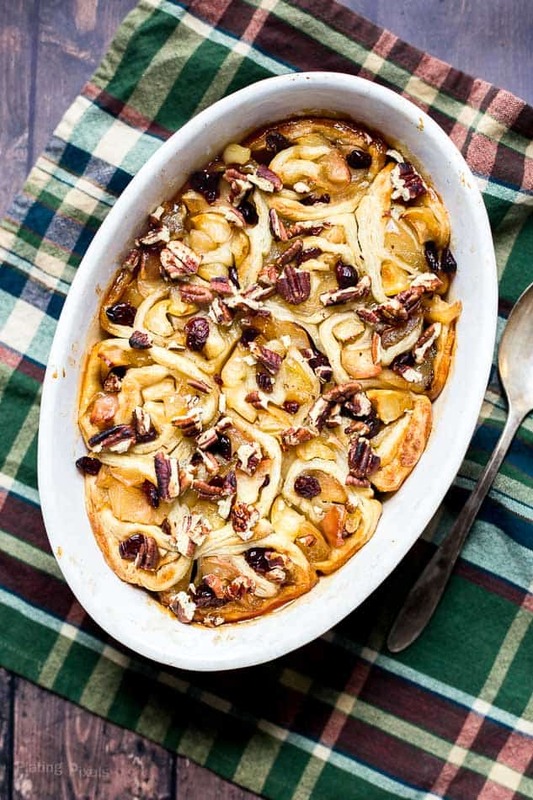 Instead of a homemade or store-bought pie crust, puff pastry sheets create a simple and unique “crust” for this apple pie casserole. What apples to use for apple pie rolls? Granny smith is the most common for classic apple pie. They are firm and hold their shape, and are a bit tart. Golden delicious, pink lady, Fuji and gala also work well. For this Apple Pie Puff Pastry Rolls I recommend gala or Fuji. They are softer so the texture of puff pastry and the crunch of pecans come through more. They are also more naturally sweet so less sugar is needed. Why do some apple pies come out soggy? Apples naturally have a lot of water. When you bake a pie those juices leak out and puddle up in the crust. It’s best to cook apples ahead of time in a pan when making apple pie. This brings out the natural sugars, reduces liquid and softens them up. Generally if an apple pie recipe doesn’t call for this step it may come out soggy with undercooked apples. Cook apples in a pan with butter and sugar. This softens them up, brings out natural sugars and reduces liquid to prevents them from being soggy. Bake 20-25 minutes at 350° F, or until dough is cooked through and golden on top. Garnish with toasted pecans. Simply flatten out the thawed sheets into a rectangular shape. Top with the apple pie filling and roll into a tube. Then cut into sections and place in a casserole dish on their sides. 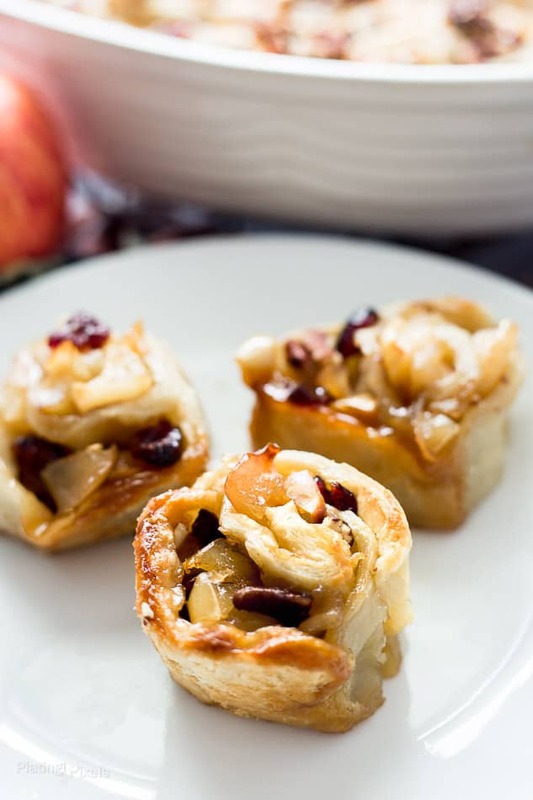 They bake into each other and puff up to create pull-apart single serving apple pie rolls with flaky, crispy layers. For a classic golden crust look, brush with a bit of egg before baking. This gorgeous recipe is quick and simple thanks to puff pastry sheets. Surprise your guests or family during your next holiday or fall gathering. 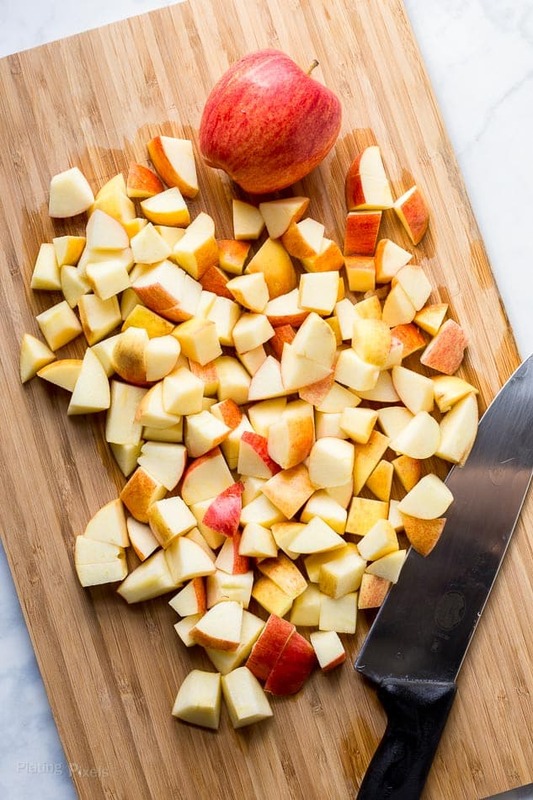 With just a short amount of prep and a handful of ingredients your kitchen will be smelling like apple pie in no time. Flavor profiles: Sweet and fruity fall flavors of apple, cranberry, brown sugar and cinnamon. Texture: Soft apple pie filling encased in flaky, crispy pastry layers. 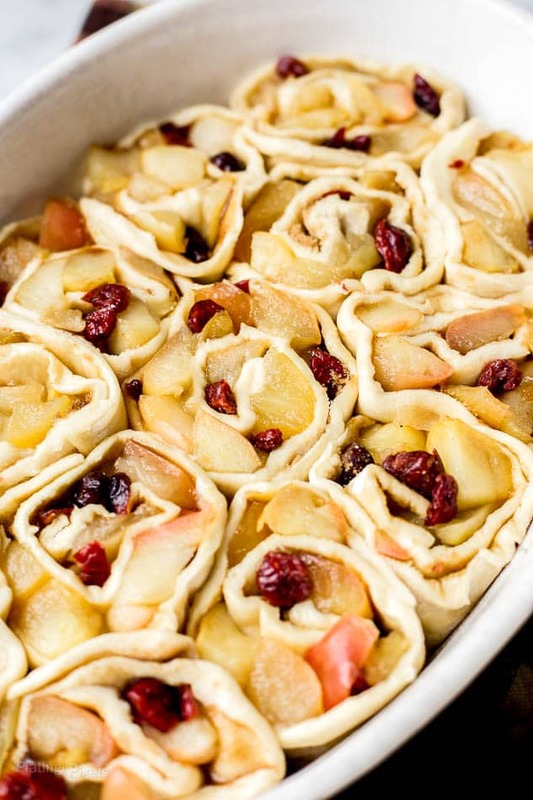 Easy apple pie and cranberry filling inside flaky puff pastry layers, rolled and baked as a pull-apart casserole for a unique fall and Thanksgiving dessert recipe. Preheat oven to 350° F. Core and cut apples into small cubes, leaving skin on. Melt butter in a large non-stick pan over medium heat. Stir in apples and granulated sugar. Cook, stirring occasionally, for 10-12 minutes until apples are soft and tender. A lot of liquid should draw out, discard or use for another purpose. Remove from heat and stir in cranberries. 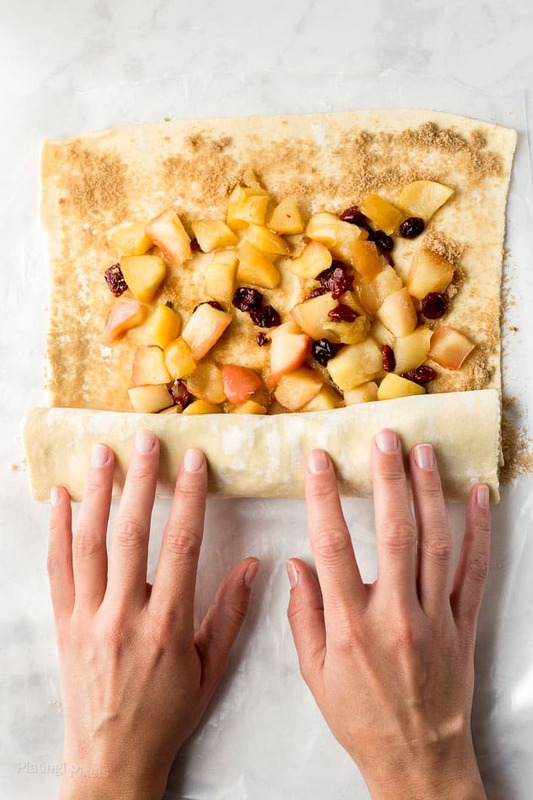 Roll Puff Pastry Sheets onto a flat, lightly floured parchment-lined surface. Use a rolling pin to flatten slightly into a rectangular shape. 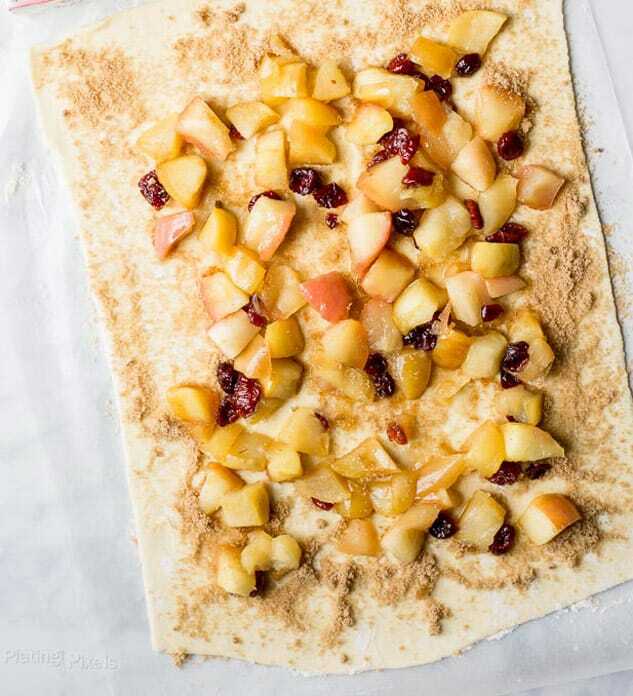 Top with drained apple mixture, then evenly sprinkle both sheets with brown sugar and cinnamon, leaving about ½-inch from edges. Using the parchment to lift, carefully roll from the short end to create a tube. Cut into about 2.5 inch pieces. Place in a greased casserole dish on their sides; lightly touching but not packed. Brush tops with egg. Bake 20-25 minutes, or until dough is cooked through and golden on top. Garnish with toasted pecans. Be sure apples are ripe and smell sweet. This is the main flavor and sweetness of this recipe and will affect the results greatly. Cooking apples ahead of time softens them up, brings out natural sugars and reduces liquid that can leak out during baking. You’re making this girl drool. They look so good. I’ll have to try your recipe out. Thanks for sharing. These look perfect for Thanksgiving! I think this looks way simpler than an entire pie and they are really pretty! What a tasty treat! I love how they look similar to cinnamon rolls! That’s a good point! Thanks Allison. This looks absolutely gorgeous! I can see my whole family loving this after a big Sunday dinner! I love using puff pastry! This treat looks delicious! So do I! Thanks Ellen.